C. Vann Woodward, who died in 1999 at the age of 91, was America's most eminent Southern historian, the winner of a Pulitzer Prize for Mary Chestnut's Civil War and a Bancroft Prize for The Origins of the New South. 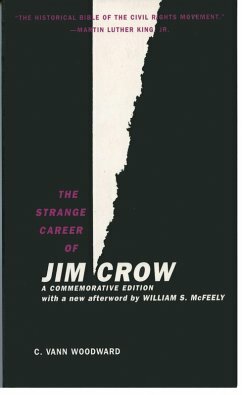 Now, to honor his long and truly distinguished career, Oxford is pleased to publish this special commemorative edition of Woodward's most influential work, The Strange Career of Jim Crow. The Strange Career of Jim Crow is one of the great works of Southern history. Indeed, the book actually helped shape that history. Published in 1955, a year after the Supreme Court in Brown v. Board of Education ordered schools desegregated, Strange Career was cited so often to counter arguments for segregation that Martin Luther King, Jr. called it "the historical Bible of the civil rights movement." The book offers a clear and illuminating analysis of the history of Jim Crow laws, presenting evidence that segregation in the South dated only to the 1890s. Woodward convincingly shows that, even under slavery, the two races had not been divided as they were under the Jim Crow laws of the 1890s. In fact, during Reconstruction, there was considerable economic and political mixing of the races. The segregating of the races was a relative newcomer to the region. Hailed as one of the top 100 nonfiction works of the twentieth century, The Strange Career of Jim Crow has sold almost a million copies and remains, in the words of David Herbert Donald, "a landmark in the history of American race relations." Woodward is one of the most influential and distinguished southern historians in the 20th Century. He received the Pulitzer in History in 1982 for Mary Chesnut's Civil War. McFeely is a well-known historian and biographer. He won the Lincoln Prize in 1992 for the biography Frederick Douglass and the Pulitzer, in 1982 (the same year as Woodward) for Grant: A Biography.